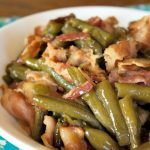 When you need a fantastic side dish to bring to a potluck or family gathering (think Easter, Christmas or Thanksgiving) you cannot go wrong with these fantastic green beans. 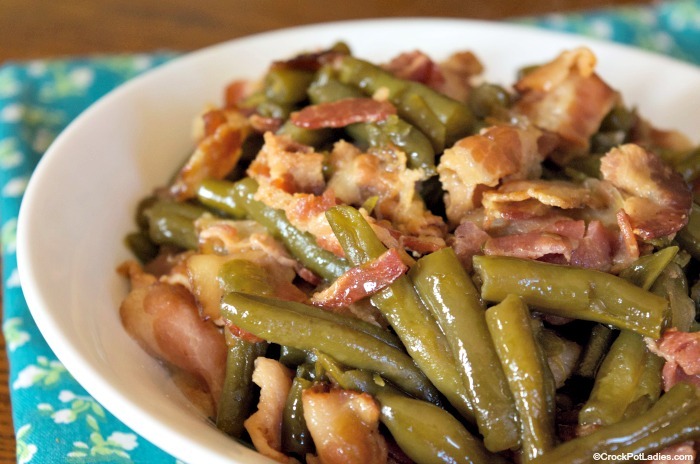 The sweet and salty combination you get from the maple syrup, brown sugar and bacon is the perfect combination to the green beans and onion. I used canned green beans because that is what I had on hand but if you like your green beans a little more crisp feel free to use fresh green beans that have been washed and trimmed and then add 1/4 cup water to the slow cooker when you add the green beans so that there is a little liquid to help those fresh green beans cook. Because of the bacon and sweet maple syrup and brown sugar my kids actually LOVE this recipe and I can easily get them to eat their veggies! In a sauce pan, heat bacon and onion just until bacon is cooked (do not brown the bacon). 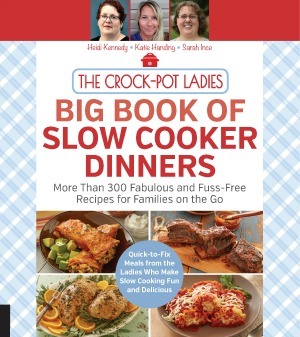 Drain green beans and empty into a 5 quart or larger slow cooker. 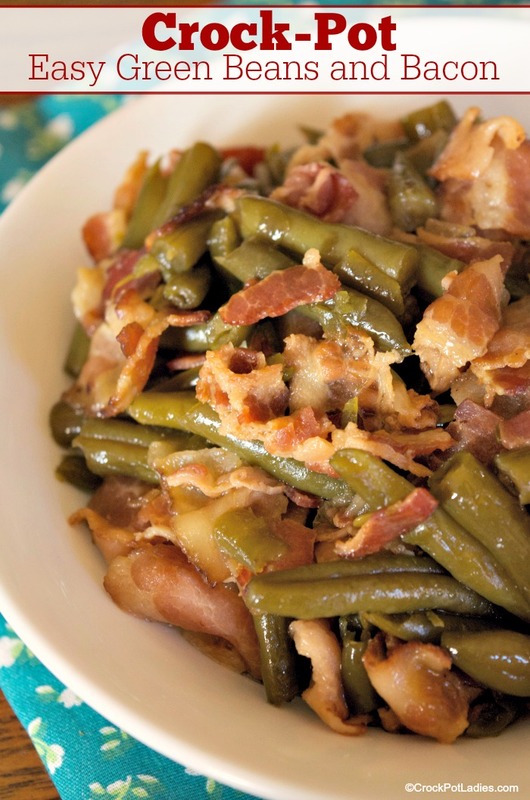 Add bacon, onion and drippings on top of green beans. Add in brown sugar and maple syrup and stir well. Do not be afraid to substitute fresh green beans or even frozen green beans for the canned green beans in this recipe. I made these for an Easter side dish. I was really hoping they’d be great, but they were disgusting. I will not be making them again! I am sorry you didn’t like the green beans Lauren. I am not sure what to say except that I guess each person has their own tastes and preferences. Not exactly low sodium either by the time you add a main dish to it.